Side sleeping is the most popular sleep position. In fact, 63% of us do it. But if you don’t get your pillow right, it can be a pain in the neck. Literally. We’ve thoroughly researched and handpicked a small selection of the best pillows for side sleepers. What Happens to Your Neck When You Sleep on Your Side? 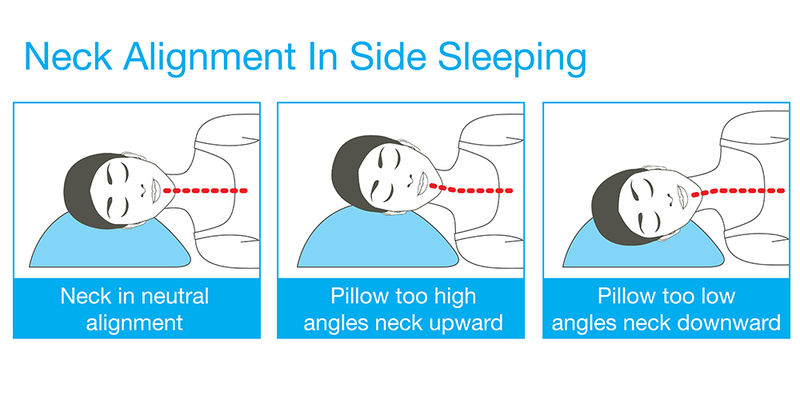 Neck misalignment is a common casualty of side sleeping. The head’s location between the shoulders means that when you lie on your side with your shoulder and hip supporting the body, there is a gap between the mattress and the position your head needs to be in to maintain a straight, aligned spine. If a pillow does not offer the height and support needed to bridge the gap between the mattress and the optimal head position, it results in headaches and disruption to sleep, as well as pain, stiffness, and fatigue in the neck, shoulders, and back. Poor spinal alignment also causes pinched nerves in the back and neck, leading to long term issues and chronic pain. If you’re looking for a pillow for your neck pain, read this guide. A good-quality supportive pillow can minimize the strains of side sleeping, ensuring that your spine remains in a neutral position while you sleep your way to an energized morning. The Snuggle Pedic offers the definitive comfort-meets-support sleep solution, with its dense memory foam filling that is designed to retain its shape all night long. No more waking up to plump your pillow in frustration! The luxurious Kool-Flow micro-vented cover ensures that sweaty sleeping is a thing of the past- you might as well be resting your head on an air-conditioned cloud! Pillow perfectionists have the ability to customize the height of their pillow quickly and easily- simply unzip the pillow and add or remove the foam filling until your neck gives the green light. Fully machine washable, this cushion is the pinnacle of convenience and indulgence. With a whopping 20-year warranty, you don’t even need to question the durability of the Snuggle Pedic pillow. Hypoallergenic and dust mite resistant, the Snuggle Pedic is also PDBE and flame retardant free. Wake up refreshed every morning! Filled with shredded memory foam, the Coop Home Goods Adjustable pillow ensures that you won’t be kept awake by an aching neck. Available in three different sizes, this pillow is suitable for all age and bed sizes, and the removable filling allows the user to tailor the height of the pillow to their own specific needs. With a breathable cover comprised of 60% polyester, and 40% rayon derived from bamboo, your most comfortable night’s sleep will also be your coolest. The Coop Home Goods Adjustable pillow is hypoallergenic and dust mite resistant, and can be machine washed for ultimate convenience. Coming with full CertiPUR certification, this pillow is free from PDBEs, flame retardants and other harmful toxins. Tested for comfort and durability, it comes with a 5-year warranty giving peace of mind. Height, support and breathability are the three crucial factors that define a good pillow, and the Pancake Pillow delivers on all counts. Composed of a soft microfibre filling, the Pancake Pillow offers amazing support while providing the comfort of a soft down pillow. Great for those who find memory foam alternatives too firm. This is a layered pillow, with the exterior casing filled with 6 separate interior pillows which are added or removed as desired. Give your neck and back the luxurious cushion they deserve! The exterior casing and internal pillows are machine washable, and extra casings can be purchased if you wish to split your pillow into 2. Snuggle up with the Snuggle Pedic Body Pillow! Filled with shredded memory foam, this prop will mould to the contours of your body and stay plump all night long without sagging. At 54 inches long, it can be used in a variety of positions to ensure that your knees are supported and hips remain free from pressure while you side-sleep the night away in blissful peace. Fully machine washable, the Snuggle Pedic Body Pillow is also hypoallergenic and dust mite resistant. The Kool-Flow micro-vented cover promises maximum breathability, keeping your body cool while you sleep. Ideal for side and stomach sleepers, as well as pregnant women, this is the only body pillow you’ll ever need. The 20-year warranty says it all! Does your back pain keep you up at night? Is your sleep marred by frequent waking due to stiffness, pain or discomfort? Then the Comfilife Knee Pillow could be the answer to all of your dreams! Ideal for easing back, hip, knee and leg pain, this pillow is a wonderful support for side sleepers. Bearing the upper knee, the Comfilife relieves pressure in problem areas, encouraging the spine to sit in perfect alignment so that the back gets the required respite and recuperation. Lying in this prime posture while sleeping also promotes circulation. Pregnant? Don’t let sciatica or pelvic pain ruin your much-needed sleep. The Comfilife Knee Pillow is the only maternity support you’ll need! Ergonomically designed, this pillow can be used in a number of different positions to ensure comfort, and the high-density memory foam promises to keep its shape for years to come. The quintessential pillow offers a comfortable place to lay the weary head, while also supplementing good sleep posture. It prevents neck and back pain (or relieves existing injuries), helping you to fall asleep faster and stay asleep longer. This improved sleep quality means that the body and mind are adequately revitalized, so you have the energy to tackle each day head-on with vigour. A bad pillow, on the other hand, can wreak untold havoc on the head, neck, shoulders, back and hips. Everyone’s been there at one stage or another- your idyllic slumber brought crashing back to reality with an aching neck, and no amount of endless tossing and turning will make you comfortable again. The consequences of an unsuitable pillow go much further than disrupting sleep. Poor head and neck support result in neck and back pain, muscle cramping and impaired circulation. On a long-term basis, the constant sleep interruption will potentially cause exhaustion, anxiety and depression. In turn, these issues lead to problems in every aspect of daily existence, from work, to relationships, to leisure, thus diminishing the quality and enjoyment of life. What Type of Pillows Suit Side Sleepers Best? Side sleepers require a full medium-firm pillow to support the neck and keep the spine aligned during sleep. Log and yearner sleepers also benefit hugely from added support in the knee area, so body/knee pillows are an excellent addition to the bedtime routine. The firmness offered by shredded memory foam makes a fantastic moulded surface to support the neck while sleeping. The foam settles around the contours of the head, meaning the neck is buoyed completely without strain, keeping the spine perfectly aligned. The curve of the neck means the air passages remain open and relaxed, reducing snoring. A good shredded memory foam pillow also cools while sleeping. Memory foam retains its shape and size, so doesn’t need readjustment or plumping during the night. A body pillow is a long cylindrical cushion that wraps around the body to give added support, especially in the knee area. Available in a range of designs, from regular short cylindrical pillows, to J and U-shaped cushions, body pillows are great for easing strain in the knees and hips while side-sleeping. Body pillows are used commonly in the later stages of pregnancy to support the bump and ease the tension on pressure points, keeping the spine aligned. They also give invaluable reinforcement to people suffering from arthritis, lumbar pain and pelvic injuries. U-shaped pillows in particular are very beneficial for pregnant women and those suffering with fibromyalgia and osteoporosis. The downside is that they take up a lot of space (sometimes spreading around the body to fill the entire mattress), so are often impractical, especially for those sharing a bed. Orthopaedic knee pillows support the top knee while side sleeping, keeping the spine neutral and aligned. A lot more compact than body pillows, they are a good compromise for restricted bed space and are ideal for travelling with. Generally made of memory foam, knee pillows are ergonomically designed and are contoured for maximum comfort. They are especially useful for assisting pregnant women and people suffering from arthritis, spine misalignment, lumbar pain and hip bursitis. Although they are smaller than body pillows, they are still cumbersome and some people find it quite difficult to turn over without removing the pillow. Height adjustable pillows are fantastic for offering a tailored solution that suits all body shapes and sizes. They are usually made by stacking thinner-than-average pillows inside a larger zipped shell. The layers of pillow are added or removed as needed, meaning you get the exact amount of support needed to ensure a terrific night’s sleep. Pillows filled with shredded memory foam can also have a height-adjustable feature where the user tweaks the height by adding or removing the pillow filling to suit themselves. Sleep position plays a huge part in determining the quality of your sleep, so it’s imperative to get the balance right. Sleeping on the back is the best posture to ensure that the spine is aligned and relaxed but unfortunately, many people (especially snorers) find back sleeping uncomfortable. Side sleeping is almost as beneficial to your back. However, there are a few pitfalls to look out for. A normal side sleeping position provides no support for the top knee, meaning it is either resting directly on top of the lower knee, or overreached onto the mattress below. Both positions cause spine misalignment resulting in pressure, strain and fatigue in the knees, hips, back and neck. This affects the quality of sleep and causes ongoing stiffness, pain and frequent waking. Just as different pillows complement different sleeping positions, side sleepers also need to consider specific mattress features to optimize their posture. Whoever thought that sleeping could be so complicated?! A good mattress will have the firmness to support the pressure points of the body without compromising on comfort. Combination mattresses have a traditional spring interior for support, but also provide a pressure relieving top layer which gently cushions the body while you sleep. Advanced mattresses have a gel or latex support layer which moulds to the contours of your body, distributing weight evenly and providing maximum relief and support. Side sleepers need a medium/medium-soft mattress to ensure that their back and neck are supported, while the hips and shoulders are gently cushioned and sink slightly into the surface of the mattress. At face value, there are 3 main sleeping positions- front, back and side. However, on closer inspection, there are actually 6, and each come with their own advantages and disadvantages. Remarkably, according to research conducted by Professor Chris Idzikowski, a specialist in sleep assessment, a person’s sleeping posture can also reveal hidden personality traits. Fetal position is the most common sleeping pose, with over 40% of people choosing to go back to grass roots and sleep on their side like a baby every night. Interestingly, women are twice as likely to be fetal sleepers than men. Fetal posture allows the spine to maintain its natural alignment, meaning the pressure points remain neutral and stress-free. Finding a comfortable, relaxed sleeping position is the best way to guarantee a refreshing night’s sleep. Apnea sufferers and snorers favour the fetal position as it eases the symptoms of their malaise. It also improves circulation, meaning better blood flow. However, lying on your side puts undue pressure on the organs of the side you sleep on, so alternating sides regularly is a good idea. Prof Idzikowski’s study found that fetal sleepers tend to have tough exteriors, but are actually sensitive softies at heart. Ever wondered where the phrase ‘slept like a log’ came from? Although the log isn’t as popular as its fetal counterpart, it still makes the cut as one of the top six sleeping positions. Log sleepers crash on their side with both arms resting straight down the sides of the body. The log is another great snore-minimizer, which also reduces the symptoms of acid reflux. The position aligns the spine optimally, however, because the top leg is unsupported, the knee tends to extend over the bottom leg to rest on the mattress. This leads to rotation of the spine, which causes lower back and hip pain, and is extremely uncomfortable for anyone already suffering with lumbar or pelvic injuries. Sleeping with a pillow between the knees will prevent this strain, giving a more comfortable night’s sleep. Personality-wise, loggers are laid back socialites who like to follow the latest trends, but sometimes have a gullible nature that can be taken advantage of. The Yearner is another side position which is similar to the log, except the arms stretch out from the body instead of resting down the sides. Improved circulation and spine alignment are the biggest benefits of this pose, but as with the log, an unsupported top knee leads to lumbar and hip pain. The arms-out position also puts strain on the shoulders, causing tension and discomfort. Yearners are often open natured, but sometimes possess a cynical, suspicious streak. They like to weigh up all the particulars of a situation before making a decision or forming an opinion, and once their mind is made up, they rarely change it. Freefalling sounds like a fun pursuit for thrill seekers, but as a sleeping position, it is actually the worst posture for your health. The only benefit to sleeping on the stomach in the freefall position is that it may help to ease digestive discomfort. The drawback of freefalling lies in the neck positioning. Not many people will sleep with their face pressed directly on to the pillow, so this invariably leads to twisting and turning the head into unnatural positions, resulting in neck strain and soreness. Also, although the body is not on its back, the spine is still misaligned which gives rise to back pain upon waking. Just as you would imagine an actual skydiver to be, freefallers are friendly and boisterous, with balls to boot! However, underneath their gregarious veneer they tend to be self-conscious and insecure, and they don’t take criticism well. Ten-hut! Soldiers sleep on their backs, arms by their sides with military precision. People who sleep like this are less likely to change positions during the night. This pose is one of the healthiest in terms of spine alignment, and in addition, will ease the onset of acid reflux. Amazingly, it also reduces the risk of wrinkles as it avoids prolonged contact of the face with the pillow. Unfortunately, back positions aggravate snoring and the symptoms of apnea. Beware of using too many pillows in this pose as it will potentially misalign the neck. Soldiers generally opt for the quiet life, and don’t like being the centre of attention. However, as you would expect of a real soldier, they set the bar high for themselves and the people they are close to. Starfish is another back pose where the arms splay upwards rather than lying by the sides. As with the soldier, this posture is excellent for maintaining a neutral spinal position, but awful for snorers and apnea sufferers. Another disadvantage is that the position of the arms puts pressure on the shoulders. Starfishers are helpful and supportive, and their great listening skills make them brilliant friends. They tend to shy away from the limelight, preferring to operate in the background.